President Michael V. Drake and Provost Bruce McPheron invite you to attend the twentieth annual Diversity Lecture & Cultural Arts Series at The Ohio State University. This program offers the campus and the Columbus community opportunities to benefit from some of the most eminent scholars, artists, and professionals who discuss and exemplify inclusive excellence through diversity. 5 p.m. | Doors open at 4:30 p.m.
Space is limited and RSVP is required. Book sales & signing available on-site while quantities last. Presented in collaboration with the Center for Ethics & Human Values, The Center for Ethnic Studies, College of Education & Human Ecology, College of Social Works, Department of English, and Department of Slavic Languages & Literatures. 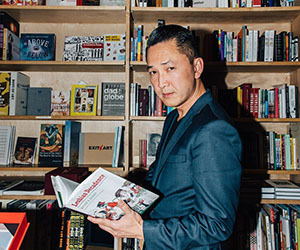 Viet Thanh Nguyen is the Aerol Arnold Chair of English, and Professor of English, American Studies and Ethniciy, and Comparative Literature at the University of Southern California. Born in Vietnam, Nguyen’s family came to the U.S. as refugees in 1975 at the age of 4, and would later commemorate this time and experiences growing up in San Jose, CA in his short story “The War Years” (2009). 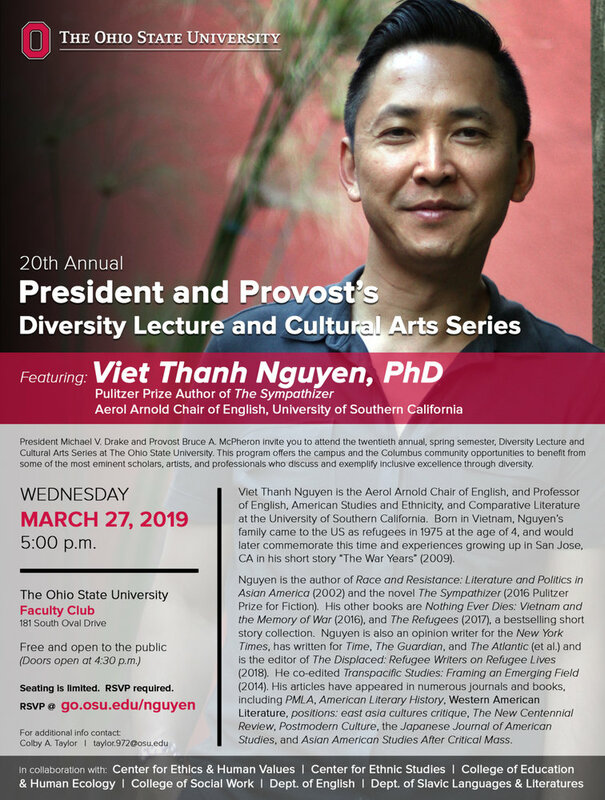 Professor Nguyen is the author of Race and Resistance: Literature and Politics in Asian America (2002) and the novel The Sympathizer (2016 Pulitzer Prize for Fiction). His other books are Nothing Ever Dies: Vietnam and the Memory of War (2016), and The Refugees (2017), a bestselling short story collection. Nguyen is also an opinion writer for The New York Times, has written for Time, The Guardian, and The Atlantic (et al.) and is the editor of The Displaced: Refugee Writers on Refugee Lives (2018). He co-edited Transpacific Studies: Framing an Emerging Field (2014). His articles have appeared in numerous journals and books, including PMLA, American Literary History, Western American Literature, positions: East Asia cultures critique, The New Centennial Review, Postmodern Culture, the Japanese Journal of American Studies, and Asian American Studies After Critical Mass. Nguyen attended University of California at Berkeley, where he graduated with degrees in English and ethnic studies. He continued his academic studies at UC Berkeley earning the Ph.D., also in English. He moved to Los Angeles after accepting a teaching position at the University of Southern California, where he has had a distinguished career as a member of its faculty.